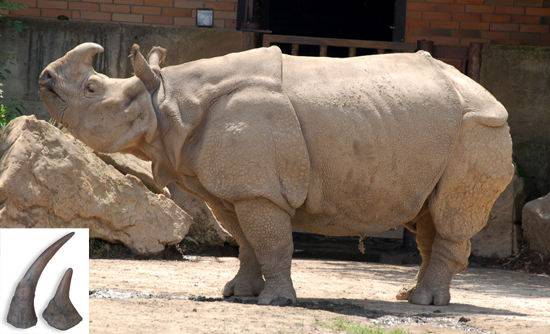 Common Name: Rhinoceros horn, Greater One-horned Rhino, Great Indian Rhinoceros, Indian Rhinoceros. Part Used & Method for Pharmaceutical Preparations: The horn of the African rhinoceros is sawn into small pieces. Then, the pieces are steamed or boiled and cut into slices or ground into powder. Meridians: Heart, liver and stomach. Functions: 1. To clear heat and relieve convulsions; 2. To cool blood and release toxins. 1. Fever, unconsciousness, delirium and convulsions. Rhinoceros horn (Xijiao) is used with Isatis leaf (Daqingye), Gypsum (Shigao) and Antelope's horn (Lingyangjiao). 2. Hemorrhagic disease due to extravasation of blood by heat manifested as vomiting with blood, epistaxis and subcutaneous bleeding. Rhinoceros horn (Xijiao) is used with Moutan bark (Mudanpi), Fresh rehmannia root (Shengdihuang) and Red peony (Chishao). Cautions & Contraindications: Rhinoceros horn should not be mixed with Wild aconite root (Caowu) and Monkshood root (Chuanwu), and it must be used with caution during pregnancy. Note: Although rhinoceros horn is a traditional medicinal substance, its scarcity encourages the common substitution of water buffalo's horn.